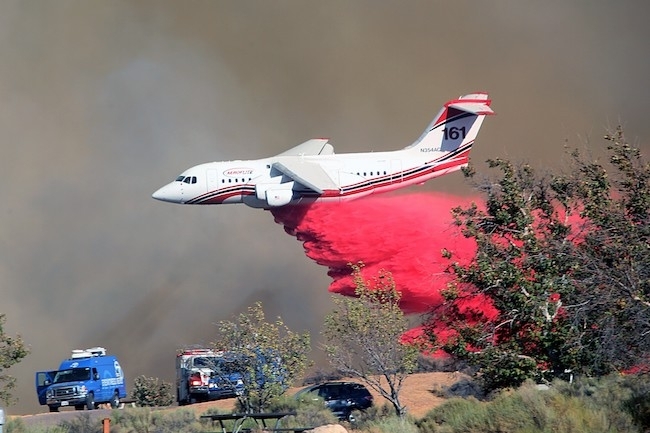 BAE Systems-built and supported BAe 146/Avro RJ Airtankers, which make up a large proportion of the next-generation firefighting fleet in North America, continue to play a pivotal role in combating the ever increasing numbers and costs of wildfires across the continent. Marking its commitment to the North American aerial firefighting community, BAE Systems Regional Aircraft is participating at the Nimes conference and is co-located on a booth with Neptune Aviation Services of Missoula, Montana and Air Spray of Chico, California – two of the three Airtanker operators/converters who have chosen the BAe 146/Avro RJ. The third customer for the British jet is Conair Aerial Firefighting of Abbotsford, Canada and its US affiliate operator, Aero Flite of Spokane, Washington who are on an adjacent booth. Between them these four operators have a current total of 21 of the four-engine jets either in service or under conversion – Conair/Aero Flite has eight Avro RJ85s in operation, Neptune has eight BAe 146-200s operating and Air Spray has converted one BAe 146-200 with four more to follow. By September this year wildfires in the USA had cost the United States Forest Service (USFS) $2.35 billion, topping the previous record set in 2015 of $2.13 billion for the complete year, according to US Agriculture Secretary Sonny Perdue. So far this year 50,000 wildfires have been recorded, burning over 8.5 million acres of land. Similarly, the Canada Wildland Fire Information System reports that to date this year 4,870 fires have been recorded, burning nearly three million hectares. Costs of combating Canadian wildfires have risen in the last 10 years from about C$500 million a year to C$1 billion a year. In Europe, according to statistics from the European Forest Fire Information System (EFFIS), by mid-August 2017 the number of forest fires in the European Union had reached over 1300 blazes, up dramatically from around 400 seen annually on average over the past eight years. The number of hectares burned in the same period has risen from an eight year average of around 150,000 to reach 550,000 so far this year. To help combat North American wildfires this year Conair/Aero Flite has had seven RJ85s operating in the USA and one in British Columbia, Canada. They have flown over 206,000 miles (equivalent to eight times around the world), have made 2,200 drops of retardant totalling 19.6 million litres (equivalent to eight Olympic swimming pools). In addition, Conair will once again be sending an RJ85 Airtanker to Australia under contract to the State of Victoria for the December – March fire season ‘down under’. Jeff Berry, Director of Business Development for Conair, states that the wildfire agencies that they have worked with in the USA, Canada and Australia have been very impressed with the RJ85 platform and the drop pattern. He adds: “We are continuing to develop additional RJ platforms to meet global market demand.” Neptune Aviation Services’ eight BAe 146-200s have also had a busy 2017 so far supporting their continuing exclusive use contracts with the USFS and an exclusive use contract with the State of California (CALFIRE). Neptune also won a contract to supply a BAe 146 to help combat wildfires in Chile between early February and early March. In what Neptune describes as ‘an unprecedented US fire season and the worst on record in their home state of Montana where more than one million acres have been consumed by fire’, the Neptune BAe 146 fleet has already surpassed more than 2800 missions (compared to 2347 for the whole of 2016 when it dropped over seven million gallons of retardant) and the company anticipates total BAe 146 hours to exceed 3500 hrs for the year. Air Spray has completed conversion of its first BAe 146-200 Airtanker and flight tests are well underway as part of the final process of obtaining US Federal Aviation Administration (FAA) certification for the Supplemental Type Certificate approval. The company reports that from the flight tests during maximum flow/3200 gallon drops the aircraft reaction is very docile and predictable. Drop tests over the USFS qualifying grid are expected soon which will lead to Interagency Board approval and the aircraft will be available for the 2018 fire season. Air Spray’s second BAe 146 is now undergoing airworthiness checks including compliance with the BAE Systems Corrosion Protection and Control Programme and the Supplementary Structural Inspections Document which will enable the aircraft to continue operations for many more years. Once these have been completed, the aircraft tank conversion will commence. As the Original Equipment Manufacturer (OEM) for the BAe 146/Avro RJ BAE Systems Regional Aircraft has collaborated with all these Airtanker operators and converters in various ways to provide specialist technical design and engineering support – a vital and continuing service to support these demanding applications. Full 24/7 spares support is also available.